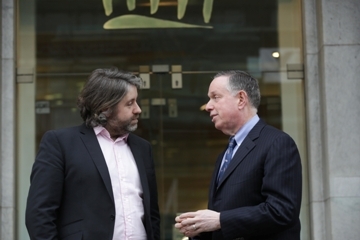 Stuart McLaughlin, Business to Arts and Michael Kaiser, Kennedy Center at the National Concert Hall announcing the new intake of participants for Year 2 of the DeVos Institute partnership. Business to Arts and the DeVos Institute of Arts Management at the Kennedy Center are delighted to announce the 8 Irish arts organisations that have been selected to participate in the second year of Planning for Success in the Arts: a Capacity Building Intensive for Arts Managers and their Boards. Identified through a competitive process, these organisations will take part in a year-long teaching and mentoring intensive, joining 11 of our original intake who will participate in a second year of the programme. The programme is modelled on the DeVos Institute’s successful international programmes for arts organisations and managers and combines annual group seminars, regular online working groups, and ongoing, one-on-one consultation. Over the past year, 15 organisations have taken their learnings from the programme and have begun to implement a number of changes to their marketing strategy, Board, programming structure, and fundraising tactics. A series of interviews on how the DeVos programme has led to change in these organisations can be found on the New Stream Blog. ‘Planning for Success in the Arts: a Capacity Building Intensive for Arts Managers and their Boards’ is part of New Stream, a project operated by Business to Arts and supported by Bank of America Merrill Lynch.